A week ago Netflix released all 13 episodes of House of Cards, allowing subscribers to watch the series in marathon sessions. Variety noted “the efficiency that makes binge viewing so compelling also accelerates the time a consumer spends with Netflix.” This novel release schedule highlights the question of how consumers value paid content relative to consumption time. The time spent consuming information and entertainment goods is an important element of the overall satisfaction (or, as economists call it, utility) they provide. So while consumers may not use a calculator each time they go to the movies, buy a book, or subscribe to a magazine, the calculation of utility is implicit in every transaction, despite any obstacles in comparing media across platforms. In our increasingly digital world, the challenge for consumers in determining a given product’s value or utility will continue to shrink, creating an environment where consumers will explicitly consider “Cost Per Hour,” or CPH, when buying content. Likewise, providers will have the tools to measure CPH and the ability to influence it. The result is that providers who embrace CPH as a metric will have greater opportunities and success for charging consumers for their content. With analog channels, consumers associate value with the plastic, celluloid, and newsprint that are mere containers for the content itself. (The value of television programming, too, is clouded by distribution considerations. If the cost of the “dumb pipe” is stripped out, video content fees would become transparent.) Consumers will have an easier time making CPH calculations when they pay for zeros and ones separate from paper and pipes. The chart below shows a few sample CPH calculations for selected channels for U.S. consumers (figures taken from a variety of sources and are meant as illustration). From listening to bundle bashers, cord cutters,and over-the-top enthusiasts, one would assume consumers suffer from an astronomical pay TV CPH, yet it turns out it’s a serious bargain. And if you were to adjust for the average 2.6 persons per U.S. household, pay TV’s CPH drops to a mere 23 cents! (But similar adjustments apply to Netflix, the most economical option among the listed channels.) Newspapers and magazines, which tend to count pass-along readers, deserve a CPH adjustment, too. Digital media will help solve the valuation problem associated with multiple users. The future promises greater use of personal consumption devices like smartphones and tablets, as well as greater personalization of shared screens (be they computers or TVs) such as with Netflix’s planned personal profiles feature. Future generations will know only digital information goods. So their value calculations, unlike ours, won’t be rooted in analog versions or clouded by digital-analog bundles. Instead they will be keenly aware of a product’s value proposition based on CPH. For media companies, the difficulty of measuring time spent with analog content is well known. Time magazine is unaware if a subscriber has read an issue cover-to-cover or simply deposited it, unread, in the recycle bin. Likewise, Nielsen certainly provides insights into TV viewership, but today’s television ratings are a blunt instrument compared with the possibilities afforded by digital platforms. Digital content providers, informed by enhanced analytics, are starting to have a growing tool set to positively impact CPH. As an example, the Wall Street Journal Online offers readers 76 newsletters and alerts and maintains 26 Twitter accounts to encourage them to engage more with its product. These digital methods for pushing content to readers and drawing them back to the main property increases engagement, which results in a real drop in CPH. As an example of a company that has long understood the impact of the principles of CPH, Netflix famously offered a $1 million Netflix Prize to anyone who could create a better prediction algorithm for accurately matching its viewers with content they’d like. As Netflix clearly understands, better content discovery translates into more viewership and smaller CPH – and in turn lower churn, as customers find value in the product. The media and entertainment business grows more complex as consumers increasingly expect any content, any time, any place, on any platform. Concurrently, consumers migrating from analog to digital platforms will become more sensitive to the relation between price and consumption time. CPH is an actionable metric for an industry seeking profitable models for charging consumers. David Justus is a principal at contentcurrents.com, a digital media consultancy. Follow him on Twitter @ContentCurrents. What this fails to take into account is the active/passive viewership, e.g the 32 hours of Netflix viewing is likely intentional and selective, whereas TV is sometimes just on a particular channel or show because “nothing else is on.” Sure those hours count, but they are not the “valuable” hours a consumer would mentally equate in their personal CPH calculations. Mix advertising in as 1/4-1/3 of every hour as well and the “value” drops even further. I’d be surprised if that distinction does not play into the consumer placing a much greater perceived value of Netflix vs. Pay TV, even if the numbers prove otherwise. 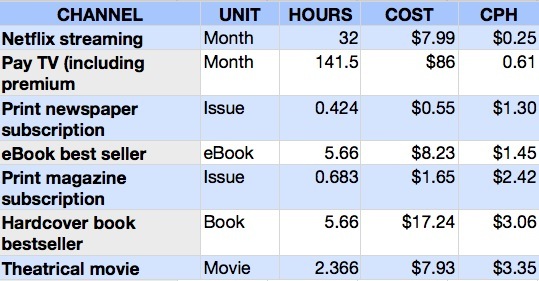 Yes, consumption time is one of the many elements of paid content utility. Others include: Consumption style (active/passive), Content category (news, entertainment, etc. ), Status (http://bit.ly/ynXdEK), and Quality. I think there are two types of quality: Production value, which is largely objective, and satisfaction/enjoyment, which is highly subjective. What are the other elements of paid content utility? Everything old is new again. The irony is that when AOL was in its fledgling days in the early 1990s, they paid content providers based on how many hours users spent in their branded content area. At the time I was in charge of Business Week’s relationship, and I recall fighting this metric … with business media, less time finding and consuming what you’re looking for can actually be the better ‘value’ for the user! That’s a great point! For selected content categories there may be an inverse relationship between consumption time and utility. I’d think stock market data for consumers, as opposed to perhaps all business media, is one example. Another one is weather. Every morning I want to learn the local forecast quickly. In both instances, a quality experience may be short individual visits, but of high frequency. Even when the overall consumption time is added up, my sense is that the total – for these unique content sets – would not be a good indicator of utility. Not as significant, but the Netflix viewing listed above appears to be somewhat overstated. Reed Hastings’ Facebook post in July claimed that Netflix had delivered 1 billion hours of streaming video in June. Assuming that the 1 billion hours claim is still valid, spreading that over 33.3 million global streaming users results in 30 hours per month of average viewing, and a cost per hour of 27 cents. Thanks for your comment. It sounds like you know the space well so I appreciate your participation in the conversation. GFK estimates the average Netflix user watches 8 hours per week. http://bit.ly/145lwV5. The $86 figure for Pay TV (including premium) is from NPD http://bit.ly/145jfcB. The hours are from Nielsen and include Live TV + DVR playback http://bit.ly/145jm80. If newspapers and magazines tend to count pass alongs as audience, so must Netflix. I may have a movie party at my house, and 6 of my friends may get together to watch the latest shows. Even couples trvelling together may share an iPad screen to watch a show together. Most media and information products are consumed by more than one person today. Shared consumption is tracked more closely today for platforms that are ad supported, like newspapers and magazines, because publishers want all eyeballs counted. Increased content consumption on tablets and smartphones, which are primarily personal consumption devices, should reduce shared viewing experiences. As tablet prices drop and screen sizes decrease (e.g. iPad Mini), shared viewing on tablets will likely fall. But, as you suggest, it probably won’t evaporate. For screens that are shared today – PCs and TVs, new technologies, like Netflix personal profiles and Samsung smart tv facial recognition (http://bit.ly/U3ak9M), will enable better tracking. These technologies may be most effective when multiple persons use the same PC or TV sequentially, as opposed to simultaneously, as you point out. these are all great numbers but have you done a reality check? is a 3 hour movie worth more then a 1.5hr one? what happens when someone reads slow? When an episode of a TV show ends, Netflix automatically starts the next episode after 15 seconds. This makes it difficult to get up from the couch. I noticed that functionality this morning, when my kids were watching a cartoon series on Netflix. It’s a great example of how Netflix keeps subscribers watching and, in turn, the CPH down. That 141.5 hours for cable must already be adjusted for multiple viewer. How many people can spend an average a 5 hours a day watching TV?